Hi & welcome to the new home of clickbelow.. here is the pictorial tour.. you'll notice a generally wet theme.. surprize surprize. 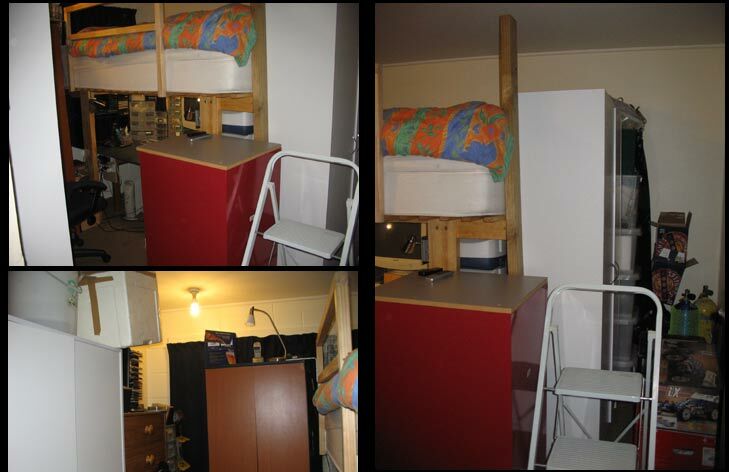 I moved from a 2 bedroom flat with 85 square meters of floor area into a single bedroom flat approx 35 square meters. 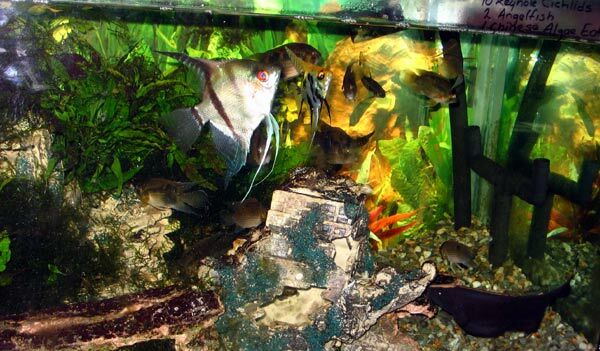 When I started I had up to 23 aquariums now its down to 4 sometimes 5 if the quarantine tank is in operation. Due to the fact the old place was absolutely chocka full of er.. stuff.. I had to condense somewhat and utilize the floor area much more efficiently.. 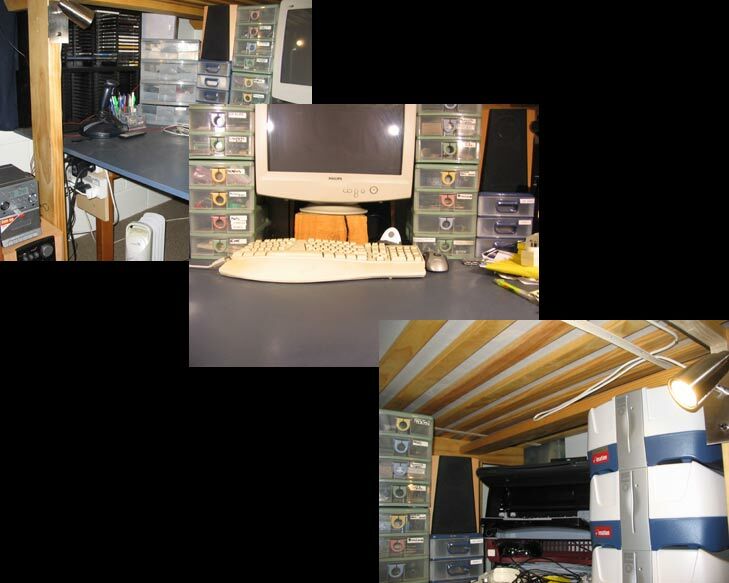 I began with a bare box pretty much ripping up and relaying carpet, scrounging a kitchen bench and cupboard set and assembling as there wasn't much of a kitchen. 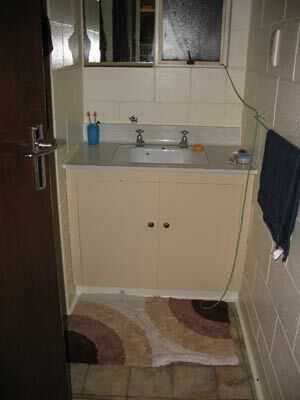 Much of this sort of thing can be done fairly cost effectively although to redo this place and move was still a 4 figure job and took about a month to do all the work that was needed (working at the same time) and finally get settled. What started as a lounge/kitchen a bathroom and a single bedroom has become.. seperate lounge and kitchen, bathroom, office & bedroom.. so effectively although I only started with 3 primary spaces I now have 5 which all work independantly of one another and although it looks a little cramped in places (& it is) it works surprizingly well. For me on my own this is almost ideal a vege garden and garage would be the icing on the cake but in central Queenstown you take what you can get and afford.. moving again is out of the question. Below.. The Lounge.. welcome to my home. Above is what you see as you enter.. I will go deeper into some areas later on. To your left (images below) is TV, workshop tool storeage and aquarium supply & support cupboard (as you can probably imagine I had a lot of equipment left over). On the left.. as described above closed up centre speaks for itself and right shows how much is going on within the cupboards.. I started with a couple of cheapo cupboards completely redesigning the interiors adding shelves, drawers and compartments.. includes a chemical storeage area separated off.. the doors are now also handy storeage. 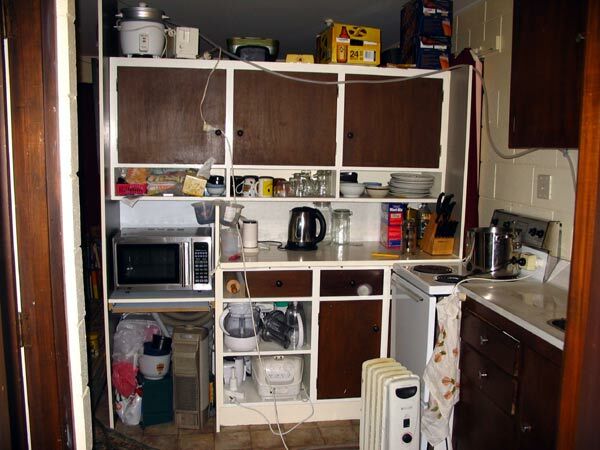 If you want to do similar you need to plan the area for what is going into it and remember if you hang stuff off doors they need to be able to close so shelves may need to be a little shallow to accomodate this. Top of cupboards hide 2 x 150watt speakers & centre along with router, projector screen (7 foot screen for full home theatre drops down in front of TV) & more shelving.. if I was to redo this area I would drop out the stereo cabinet in favor of shelving with glass doors in front so as to provide better access to components (currently some hides behind a mixer in the bottom.. its a bit overtight to work on easily and fit everything in). View from kitchen into lounge. 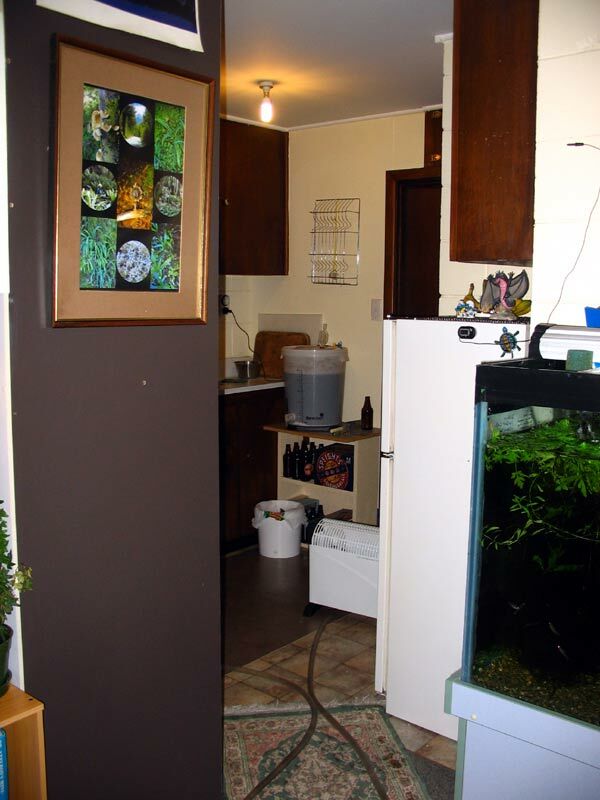 of particular note are the drawer/desk/shelving in the centre of the aquarium cupboard. I mounted these on slide out runners (max load 40kg), gives me spaces for laptop, pens, paper, remotes, batteries etc.. one of my more cunning plans works like a charm.. in the bottom of the cupboard I have space for aquarium electrics and external hard drives. The cupboard can be closed completely.. one oversight on my part was I made the top benchtop a bit high so I cant close the laptop and push it into the cupboard.. if I try to move it down door hinges get in the way so to fix this minor detail (it would put the laptop at a slightly better height for typing) I would need to rehang the door. Left.. Top tank has Guppies & Bristlenose catfish.. bottom tank is unheated with white clouds. Right.. better view of shelf arrangement and the tank houses a Black Ghost Knife Fish, 10 Keyhole Cichlids, 2 Angelfish and a Chinese Algae Eater. Below.. more photos of two main aquariums. Above.. Black Ghost Knifefish.. not brilliant photos but aquariums are not easy things to photograph.. the knifefish is a bit larger now and feeds gently (but voraciously) from fingers.. most people are pretty nervous he is of a size he could easily grab quite a bit of finger if he wanted to and is incredibly fast & pretty intelligent, has been known to have mood swings and was very grumpy for the first week in the new home. 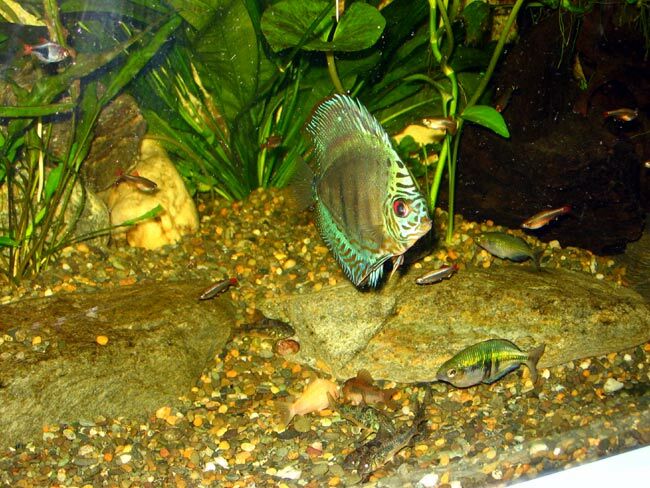 Above.. main community tank.. Discus centre Boesemani Rainbow on right by rock Corydoras catfish on bottom. Above.. main community again.. I have lowered the water level of this tank for the benefit of one of the plants which likes to breathe a bit.. the community consists of 2 Discus, 3 Whiptail Catfish (Royal I think), Black neons, Zebra Danios, and schools of: Boesemani rainbows, Rummynose, White clouds, Harlequin Raspbora, Corydoras catfish (3 varieties). 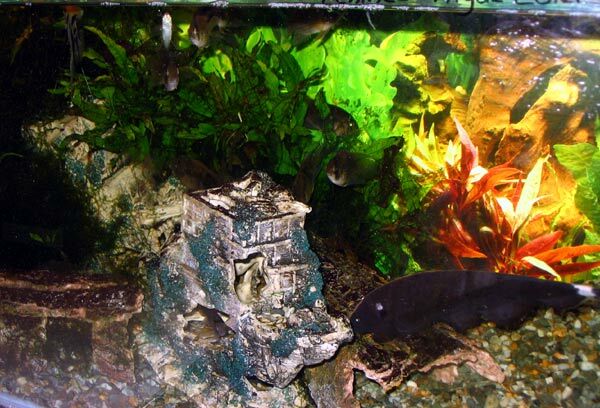 Above left..Guppies & Bristlenose not that theyre particularly visible.. there are tons of guppies in here where I am working on a lyertail snakeskin variety.. slowly messing with the stain & out crossing a bit mostly blondes. 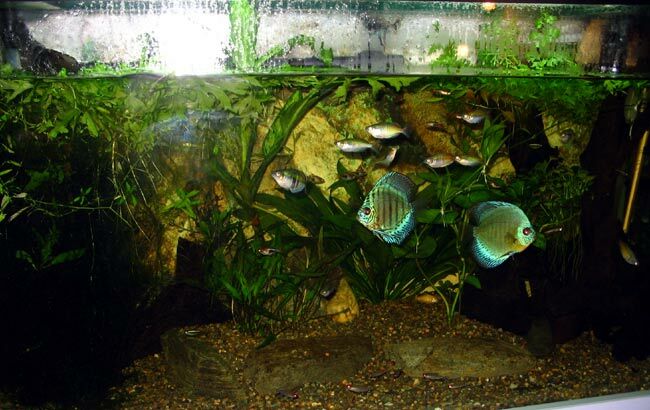 Right are is the bottom tank of the set with White Clouds.. these are incredibly tough resiliant little fishes perfect for the beginner and quite happy to breed at room temperature they dont eat their babies however big fry do eat small fry. Below "The Kitchen" .. entrance.. just done fish water hence the hose. Below.. micro brewery on the right heart of the water system centre.. it always puzzles me why this confuses people they take one look at it and have trouble getting to the water. 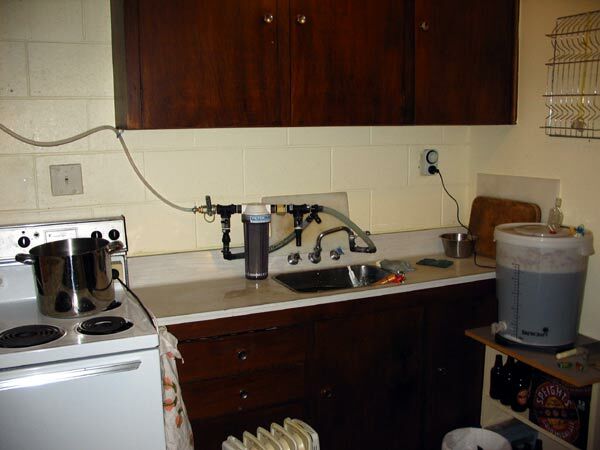 Below.. the cupboard, benches & 3/4 wall I put in to make the kitchen a kitchen, as you can see just as busy as the other side of the wall.. beneath the microwave is another slide out benchtop (very handy) on demand.. above mostly used for maturing beer storeage as that is at a premium. Below.. bathroom entrance.. very simple shower behind door toilet also on left.. probably definately the simplest room in the place. Below.. Bedroom / Office / General Store room.. yep all this going on in approx 3m x 3m.. if you cant go sideways go up.. this is the tightest space in the place it takes as little as one box on the floor to trash this room could do with being a little bigger but has dive gear sections and about everything else you could imagine.. a crazy tight room.. that said though if I can keep the spaces clear each part of the room works extremely well (just its really hard not to put anything down where its jamming something up.. moral of the story.. dont put anything down). Above.. As you can see up the stairs onto the filing cabinet to get into the bedroom.. I can actually sit upright in bed and move about without hitting the ceiling I think from memory I ended up with 600mm of space plus above the top of the matteress sure its tight but so long as you dont plan on using the bed as a trampoline its fine.. that is actually a queen sized bed on a futong base with lengthened legs to allow a 2.4 meter desk underneath. I had to cut into the bedframe to allow headroom below and re-enforce it with angle iron so the frame below the slats is only an 30mm deep. There are hand holds and rails where you need them and getting up and down isn't a problem. The rail had to be added along the side of the bed for peace of mind and so it forces you to put your legs over on top of the filing cabinet. I have beside phone touch-light clock etc. Below.. The office a large desk chair cupboard surrounding, filing cabinet on right of chair (cant get chair out the entrance is er.. snug), 3x 11 watt power saver spotlights one each side of the desk and 1 under desk (got sick of hunting for torches when I do cables etc.. for computer) about the equivillent of 180 watts of lighting all up. Quite a useable office area however I generally have been using the laptop aside fishes in lounge.. this room could do with being 4x4 meters really to be friendlier and the ceiling is actually 200mm lower than most. Well thats the tour over hope you liked it.. with a bit of thought its surprizing what can be made to work.